After Confederate Gen. Robert E. Lee's smashing victory over Union Gen. John Pope at the Second Battle of Manassas, Lee decided to invade Maryland to reap the fall harvest, gain Confederate recruits, earn foreign recognition of the Confederacy, and perhaps compel the Union to sue for peace. The Army of the Northern Virginia crossed the Potomac River on September 4, 1862. Lee divided his force, detaching Gen. Thomas J. "Stonewall" Jackson's corps to capture Harpers Ferry. At Antietam Creek on September 17, Gen. George B. McClellan's Army of the Potomac fought Lee's men to a bloody draw. Lee retreated to Virginia September 18-19.
the fork of West Main Street and Pennsylvania avenue facing the railroad. The Southern-sympathizing townspeople greeted the troopers warmly, and the cavalier colonel was the center of attention. Graciously, he gave the gushing citizens tokens of remembrance including uniform buttons, signatures, and hairs cut from his horse's mane. Rosser had captured the steed from Union Gen. John Pope a few weeks earlier. Col. John Brooke Boyle welcomed Rosser and his staff into his home for dinner with his family. The stately residence served as Rosser's headquarters for the night. The rest of Rosser's command bivouacked on John Street. The Odd Fellows Hall at 140 East Main Street, which was serving as the armory for the Carroll Guards Militia, was broken into during the night and the contents vandalized. The next day, the Confederates rode out of Westminster in the direction of South Mountain. Boyle's house is known as Rosser's Choice to this day. Location. 39° 34.625′ N, 76° 59.881′ W. Marker is in Westminster, Maryland, in Carroll County. Marker is at the intersection of West Main Street and Carroll Street, on the left when traveling north on West Main Street. Touch for map. 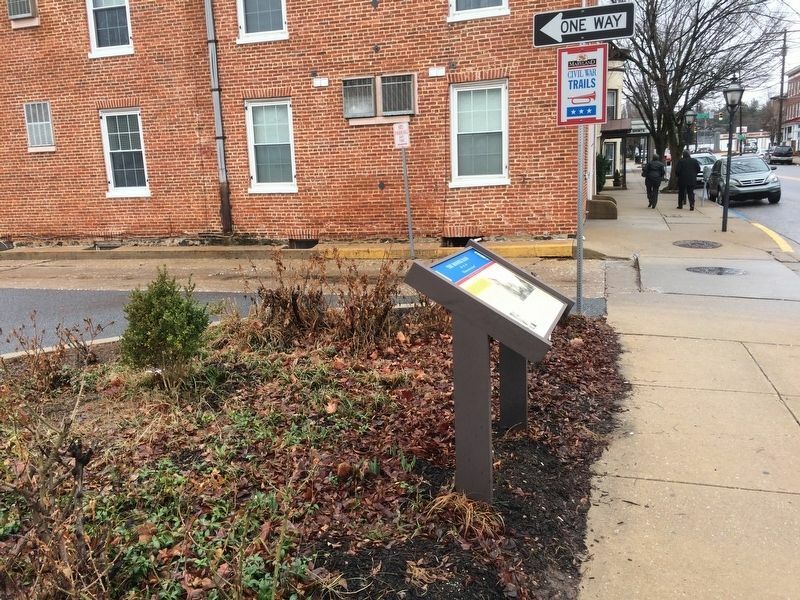 Marker is at or near this postal address: 73 West Main Street, Westminster MD 21157, United States of America. Touch for directions. Other nearby markers. At least 8 other markers are within walking distance of this marker. Westminster MD War Memorial (about 500 feet away, measured in a direct line); Gettysburg Campaign (approx. 0.2 miles away); Divided Loyalties (was approx. 0.2 miles away but has been reported permanently removed. ); Westminster Depot (approx. 0.2 miles away); Mayor Joseph L. Mathias (approx. 0.2 miles away); First Lutheran Parsonage (approx. 0.2 miles away); History Is Also Now (approx. ¼ mile away); Neal Home (approx. 0.3 miles away). Touch for a list and map of all markers in Westminster. More. 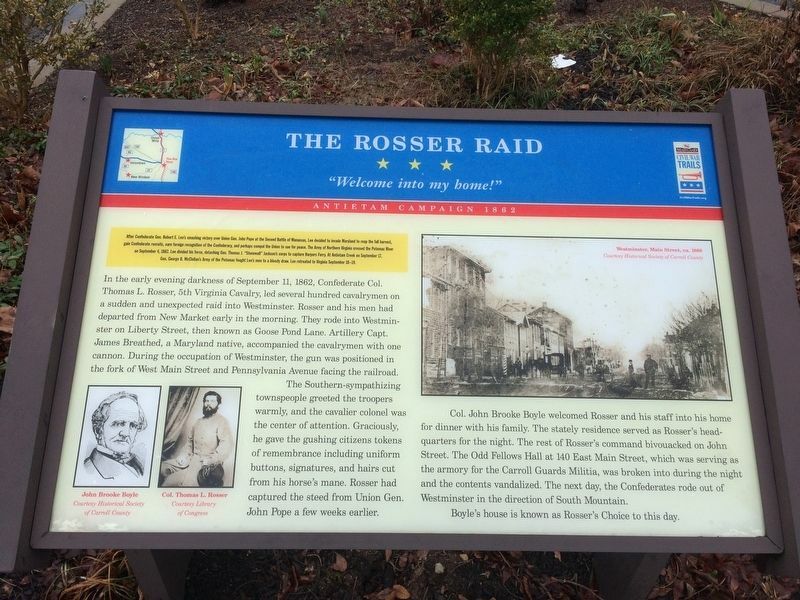 Search the internet for The Rosser Raid. Credits. This page was last revised on March 18, 2019. This page originally submitted on February 25, 2018, by Devry Becker Jones of Washington, District of Columbia. This page has been viewed 131 times since then and 18 times this year. Photos: 1, 2. submitted on February 25, 2018, by Devry Becker Jones of Washington, District of Columbia. • Bernard Fisher was the editor who published this page.